As we explored the things that make us happy, we realized that our smiles, and the smiles of others, hold a great deal of power. Anatomy of a Smile and Smile Reconstructed are outward expressions of happiness, cut piece by piece in the evolution of a breaking smile. Anatomy of a Smile was a challenge to both our skills, requiring a great deal of planning and focus to render drawings that would eventually animate in Smile Reconstructed. We purposefully chose animation and video as an extension of our digital and hand rendered works because we wanted to challenge the potential of our craft. Both animation and video are relatively new both of us, allowing us to flex both our traditional and forward-facing artistic skills. 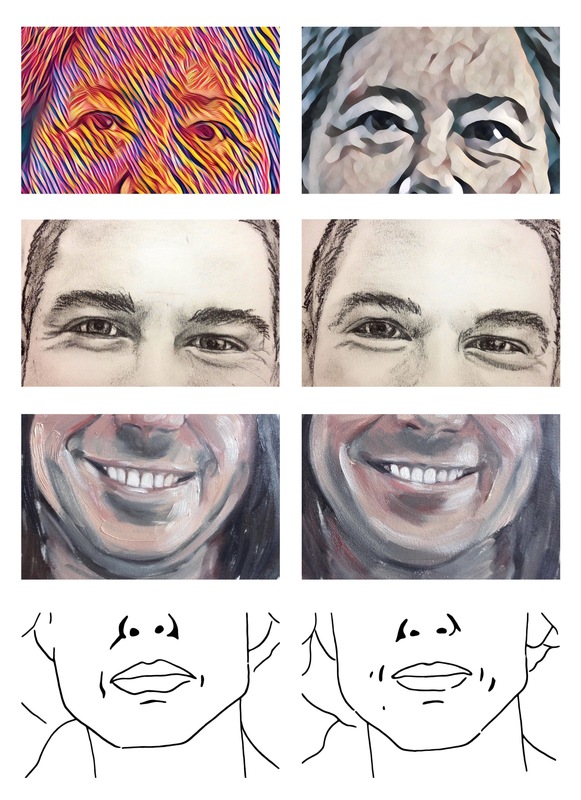 Anatomy of a Smile and the companion video piece, Smile Reconstructed, are 36 hand drawn, painted, or digitally rendered images of our smiles. Lynne McDaniels painted in oil and drew charcoal images of my face. I drew and rendered images of Lynne’s smile. Each piece of the set is 4 x 6 inches, pinned as specimens to the wall. Smile Reconstructed animates the smiles, highlighting the physical expression of happiness.